50 BLACK ALL Aluminum POP Rivet (6-16) 3/16'' dia x 1'' Max Grip by The Rivet Gallery at UCBC Group. MPN: GR-AA616B-50. Hurry! Limited time offer. Offer valid only while supplies last. 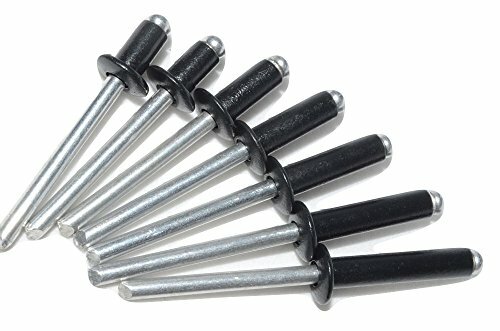 50 BLACK ALL Aluminum POP Rivet (6-16)(616)--- 3/16'' dia x 1'' Max Grip*** A WORD ABOUT GRIP LENGTH *** ALL rivets are sized by DIAMETER x MAX GRIP. 50 BLACK ALL Aluminum POP Rivet (6-16)(616)--- 3/16" dia x 1" Max Grip*** A WORD ABOUT GRIP LENGTH *** ALL rivets are sized by DIAMETER x MAX GRIP. If the rivet title says 1/8" x 1/4" OR 1/8" x 1/4" GRIP (or MAX GRIP) then the rivet body has a diameter of 1/8", and the GRIP of the rivet is for material thickness UP TO 1/4" The ACTUAL RIVET LENGTH WILL BE LONGER THAN THE STATED MAX GRIP TO ALLOW FOR "BLIND SIDE" DEFORMATION TO SET THE RIVET. AGAIN, rivets will ALWAYS be longer than the GRIP stated. If you have any questions about this product by The Rivet Gallery, contact us by completing and submitting the form below. If you are looking for a specif part number, please include it with your message.